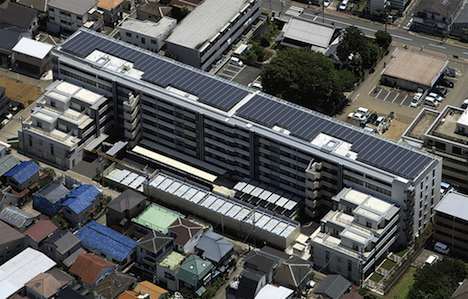 “Solar apartments”, or apartment buildings equipped with roof-top solar panels, are becoming the latest trend in the Japanese residential real-estate industry. A number of solar apartments are already speckling Japanese cityscapes across the country, with many more planned for the coming year. Leading the charge is the development company Takara Leben, whose first solar apartment went on sale last June in the city of Wako, near Tokyo. Almost immediately the new development sold out, with eager home-buyers scrambling to buy up one of its 112 units. Currently, the maximum height for solar apartments is about 6 stories. Any higher than that and the building would be less efficient at delivering solar power to its tenants, since the amount of electricity generated is correlated with the surface area of the roof. Probably the biggest reason solar apartments are doing so well is because of lingering fears in the wake of the Fukushima nuclear disaster. Many households were without power in the weeks following the massive earthquake, and since then, many people have been calling for greater development of renewable energy sources. The new solar apartments are less reliant on grid power and come equipped with large batteries in case there is a power outage. But in addition to assuaging people’s fears about being out of power following a disaster, the new apartments are also much cheaper in the long-term. According to Takara Leben, its new solar apartment can cut electricity bills by 56%. For some people, this would decrease their energy bill from ¥14,035 a month to ¥6,150 a month (from $170 to $70 US). Seeing the success of Takara Leben’s apartments, many other developers have decided to construct solar apartments of their own. What are your thoughts on solar apartments? Do you think they would be as popular outside of Japan? I note the limit on the height of the buildings, and thus the maximum density of occupation. This might be appropriate for existing low density areas, but in the heart of a major population centre like Tokyo, it’s not sufficient, as the first linked article points out. Actually, although that same article describes the apartments as small, I have to wonder if some of the attraction/popularity isn’t simply due to the relative modernity, or even the low-density nature itself, compared with the population levels in the inner cities. Perhaps building integrated solar might be able to resolve some of that soon-ish, although the problem of shadows from other buildings might not be overcome.